Come every September begins my personal favorite time of the year at Walt Disney World, Food and Wine Festival! This year starting September 14th until November 14th people come from all around to taste, learn, and experience everything that food has to offer at Disney. This is easily one of the most anticipated events at Walt Disney World. This event will bring in massive crowds for both the food and the annual Food and Wine Marathon. Nothing says gorging on food like running 25 miles.. 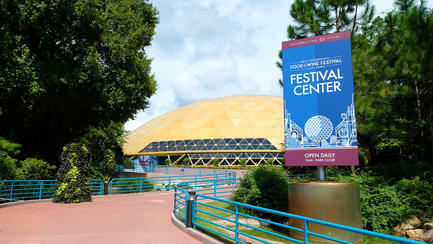 Entrance into the event is included with your ticket to Epcot. Keep in mind that the portions are little in order to taste and experience more. Food samples will range from $4.00 – $8.00, Drinks will range from $3.00-$6.00. Many items are also available as snack credits on the Disney dining plan, so no more running around last day grabbing odd candies! Along with your food, you can be entertained by a line up of bands performing. Shows are at 5:30 PM, 6:45 PM and 8:00 PM, all of course are subject to change. Personally I cant wait to eat all the cheese dishes and listen to Boyz II men. You can also experience different cooking seminars with celebrity chefs! Beverage Boot Camp Series – September 18, and October 30 – $129 – Are you serious about booze? Show how serious you are by attending thought provoking seminars like “Exploring Wines the Mondavi Way” or “Demystifying Bourbon the Jim Beam Way.” Impress your friends with your new found facts about fermentation, distillation. Parisian Breakfast – Select Saturdays during Food & Wine – $40 – This one is “only” $40 which makes this one of the cheaper Food & Wine events. Guests enjoy mimosa, coffee, baguettes, brioches, and croissants inside Les Chefs de France at Epcot.